← Happy Birthday, Captain Visual! EIGHTIES – We’re Living in the Eighties! Having read Gerry Giovinco’s fascinating posts about the origin and early days of Comico, I started to wonder when it was that I first hooked up with Gerry, Bill Cucinotta and the rest of the gang who were on the leading edge of the independent comic publishing revolution. 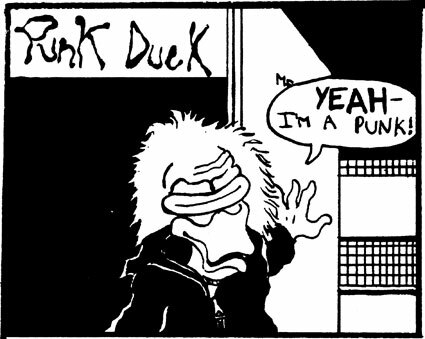 I wasn’t part of Comico, but I was part of its immediate predecessor DUCKWORK. The exact details and wheres and whos are a bit fuzzy, but let’s see what I can recollect. I entered art school in the early ’80s and it was a disheartening experience. I was a freshman and as a freshman I had to endure what the school referred to as FOUNDATION. Outside of life drawing, the whole course of study seemed to be an exercise in futility. We would move around lumps of clay or twist window screen into shapes for weeks on end in what was known as 3-D DESIGN. Worst than that was 2-D in which we would endlessly rule out series of horizontal and vertical lines for the majority of the semester for no reason I could ever discern. My guess is that it was designed as a weeding process similar to boot camp. People who weren’t serious or the dabblers or the people who thought it would be neat to go to art school would wash out. Of course, the school would get their tuition checks first. Strangely enough, I had a couple of those freshman pieces placed in the student showcase at the time. I’m not sure why. One of them was sort of a brain that looked like a maniac attacked it with a melon ball scooper all sculpted in a putrid green, Roma Plastilina clay. I called it Timothy Leary’s Brain. I guess you’ve picked up on the duck theme. 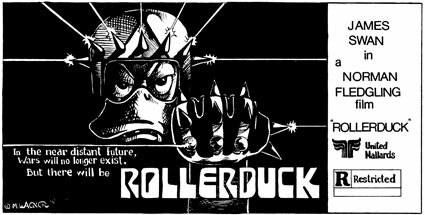 This entry was posted in Blast from the Past and tagged 1980s, art school, Bill Cucinotta, CO2 Comics, Comico, DUCKWORK, Gerry Giovinco, humor, Joe Williams, Matt Wagner, PCA, Philadelphia, Philadelphia College of Art. Bookmark the permalink.